A "red" hot book! A mini-thesaurus of the most useful transitional words and expressions, divided by category and bound in a tabbed page format, this may be the handiest writing reference you’ll ever own. Helps organize ideas in time, summary, compare/contrast, cause/effect, etc., with 500 substitutes for said! The blue book. Providing examples of eight ways to connect ideas, this companion volume to Transitional Words & Expressions gives the teacher and student model sentences and paragraphs to gain a better understanding of various transitions. The "yellow" book. Pellegrino’s newest item brings laser-beam focus to what is arguably the most essential element of good writing. An easy-to-use tool for teachers and advanced students, this 180 page book provides definitions and practical examples for thirty different paragraph structures, from description to comparison to narrative and morea natural extension for those using the TWSS approach. As a special help we have created and included a booklet with specific practice assignments for each of the thirty paragraph models to give students and teachers a concrete way to practice these powerful ideas. Pellegrino has done it again! This new comprehensive reference tool provides rules for punctuation along with clear examples to guide writers in every situation. A thumb index takes users quickly to the needed section. Every punctuation mark used in modern English can be found, including the more obscure “em” dash, ellipsis, brackets, and slash. This is a “must-have” reference for serious writers, students and English teachers. Learn "enough" about grammar to be a better teacher; coach with confidence, knowing what’s important and what’s not. This book will enrichand lightenyour concept of what English grammar is (or isn’t). Originally written for businessmen, it’s an easy read with humor, clarity, and illustrations. 206 pages, large paperback. Simple, straightforward, and accessible, this book could also be titled The Busy Persons Quick Grammar Tune-up. Ideal for teachers, parents, and secondary students whose active knowledge of grammar and punctuation may be a bit less than thorough, this book organizes concepts in a clear and easy-to-find way. 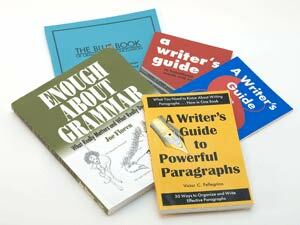 17 pages address grammar definitions and problems; 19 pages cover all major punctuation, capitalization and number issues, while the remaining 29 pages give exercises (and answers) for practice. Originally written for business use but also friendly for the school room, this thin volume can help you answer even tough questions such as Who vs. Which vs. That or how to use semicolons correctly. 68 pages, paperbound. A Word Write Now brings the concept of children’s writing resources to a whole new level! Many young writers, when looking for alternate vocabulary, will consult a thesaurus which offers few choices, confusing or inappropriate options, or no useful synonyms. This can be frustrating for child and teacher alike. In this magnificent full-color ninety page spiral-bound reference, an experienced Structure & Style writing teacher has brilliantly organized words not by definitions or meaningsbut by character qualities and behavior traits. Furthermore, she has divided the words by part-of-speech, making it simple for even young children to find appropriate and effective “-ly” adverbs, strong verbs, quality adjectives, and nouns which correspond to the character or behavior of the person, animal, event, or idea they are attempting to portray. By scanning lists such as these, children can find words that they might never have thought to use on their own. A word hops off of the page, through their eyes, into their brain, out their hand, and on to their paper allowing them to write a word they never would have thought of on their own. This process, of course, helps them to internalize and gain ownership of new words, thereby enhancing their active vocabulary and building word power for life! Following the IEW philosophy, every page has a “My Words” column for children to add their own and personalize their reference. Additionally, each section has quotations from literature to enhance the child’s understanding of each quality or trait. Although the author has given permission for parents and teachers to photocopy pages for use within a family or one classroom, this colorful book is so beautiful that each child deserves their own copyit’s a treasure! Full color throughout. 96 pages. To view a PDF sample click here.
" I want to sing the praises of "A Word Write Now" - [it's not cheap ($33 to be exact), so I initially hesitated to buy it]. However, I just got to see it for the first time and all I can say is WOW!! It's awesome! This would be a fantastic resource for those developing writers who may be short on creativity and may need to expand their vocabulary and word usage. I am imagining so many ways we can utilize this book! "A Word Write Now has been created to encourage young writers to delight in playing with words in order to improve the quality of their written expression.". I have every confidence it will do what it was intended to do! In addition to the vibrant word lists (including nouns, adjectives, adverbs), it has scriptures and quotations from classic literature throughout. . .and if I do say so myself - it's beautifully done! I feel like I'm starting to sound like a walking IEW commercial, but I just love all the products I've gotten!! Need a rep in my area?? LOL! Tina is one of the many Moms on our IEW Families site. What is IEW Families?